Posted on: April 12th, 2018	by Jennifer A. and Melanie C.
Originally published in 2013. This article about where to go for free rollerskating in New Jersey is updated every year. Did you know there are roller skating rinks in New Jersey that offer FREE roller skating for kids? You might think roller skating had its time in the sun and isn’t popular with the kids anymore, but you’d be wrong. There might be a lot of falling and stumbling and getting stuck in the middle of the rink at first, but once kids get the hang of it it’s a fun time! Get some exercise, show off your speed and enjoy your favorite tunes at a local roller rink. 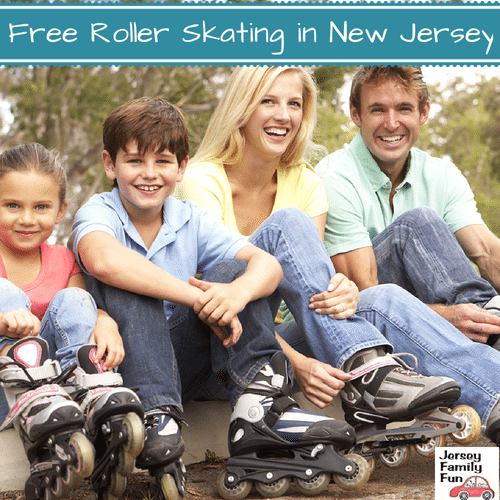 There are locations all across New Jersey but here we are sharing the spots in New Jersey where your kids can roller skate for FREE! Kids Skate Free has a complete listing of where and when kids can skate for free! Below are the 4 New Jersey skating centers that are part of the Kids Skate Free program. To view more details or register for a center please click on their name. You will then be brought to their page where you will be able to by Coupon Companion Plugin” href=”http://kidsskatefree.com/locations/NJ#”>sign up and start skating for free (after a $4 administrative fee per child). Then, about once a week you will get an email with information on downloading your free passes. You can register up to 4 children under the age of 12. Skate rental prices vary by location. Deptford Skating Center is so much more than skating! They offer an arcade, inflatables and laser tag so you can make a full day of fun. Check their website for special events like a yearly touch a truck, and weekly specials like their popular pizza buffet night. More than just skating! Enjoy indoor turfs for soccer and more, the indoor fun zone and inflatables are perfect for climbing and exploring, and the arcade offers all the classic favorites. Join them Mondays for a pizza buffet special and make it a family night out! ISC Mt. Laurel brings the fun with weekly family fun nights, pickleball, and the popular Tykes Town! Roller skating and more awaits at this second South Jersey location of ISC. Take roller skating classes or play roller hockey at Young’s in Mays Landing! Their schedule offers skating for little ones as well as weekly family and adult skate. Don’t see your local skating center? Try to recruit them to be part of the program. Click here to print out a letter from Kids Skate Free for your local skating center. If you convince them, let us know. We’d love to add them to our list.